September 21st brought news of a €500,000 price cut to the 26.5m motor yacht Little Blue and now her central agent, Maarten Ten Holter at Vripack, sends word of a further €400,000 reduction. Built by Taiwanese Jade Yachts to Det Norske Veritas class in 2007, she’s a Bandido 90 Explorer model, designed by Juan Carlos Espinosa. This bulbous-bowed superyacht can accommodate six guests in one master and two double cabins. Little Blue has a range of 3,500 nautical miles at 9 knots and a top speed of 13 knots, powered by two 875hp Caterpillar diesel engines. 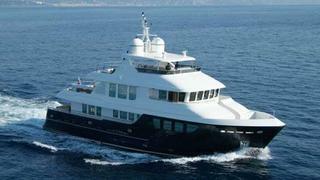 Commercially registered in Malta, her price is now down from €4.9 million to €4.5 million, VAT paid.